Check out this king size stove top griddle! This Rectangular Aluminum Non-Stick Double Griddle is a good size for cooking pancakes, sandwiches, or eggs and bacon and sausages for a large family or for company. Double burner griddle fits over two heating elements. 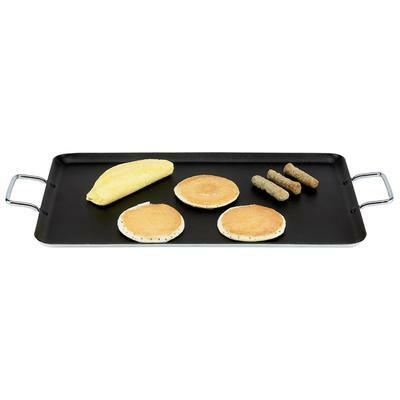 Nonstick griddle pan Allows easy pan preparation and cooking, and quick clean up. Double riveted helper handles Enhances safe lifting and carrying of the griddle.